The film that started it all – Dr. No. Set in the West Indian country of Jamaica, the film follows a British secret agent Bond who is on the mission of solving the mysterious killing of another fellow British man John Strangways. He eventually arrives to know that a certain island called Crab Key, an arcane place of mysterious happenings, possesses deposits of radioactive rocks and tat Strangways was after the same thing. He also meets Honey Ryder, a shell collecting damsel and as Bond makes way into the island with Honey, he finds out that a huge organization has its base there and is led by Dr. No. 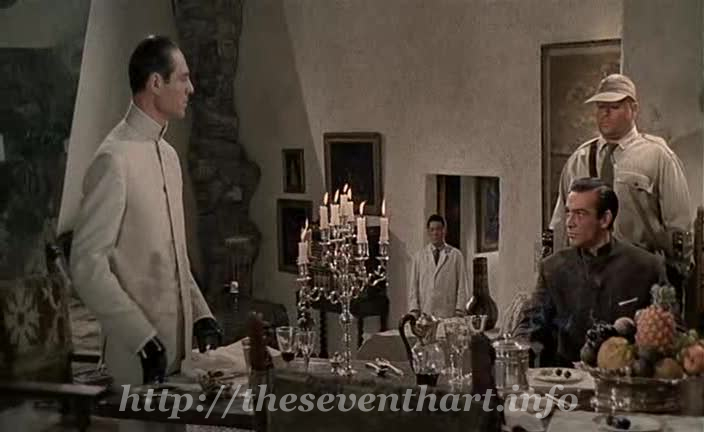 After Bond and Honey are captured by the men there, he gets a rendezvous with Dr. No that reveals the organization as SPECTRE. Can bond escape the clutches of Dr. No and save the American rockets from being destroyed by him? Apart from becoming a historical piece, Dr. No is a damn interesting film with great scenes and a superb score. My favorite Bond title track “Three Blind Mice” is in this film. Sean Connery is the embodiment of style and had already set a very high standard for all the Bond heroes to follow. Although more mellow and deliberate than the subsequent Bond films that had action taking the driver’s seat, Dr. No still remains a must watch for all action fans for the intensity of lead and for the significance of introducing us to quirky yet suave world of Bond, James Bond. The James Bond Rock is really one of the best scenary in James Bond Movies. But when I was there to see it two years ago it was really boring. The rock is tinny in comparison to the movie and it was a rainy day.